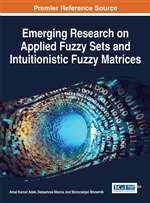 In this paper, the concept of semiring of generalized interval-valued intuitionistic fuzzy matrices are introduced and have shown that the set of GIVIFMs forms a distributive lattice. Also, prove that the GIVIFMs form an generalized interval valued intuitionistic fuzzy algebra and vector space over [0, 1]. Some properties of GIVIFMs are studied using the definition of comparability of GIVIFMs. Here some preliminaries, definitions of IVIFMs and GIVIFMs are recalled and presented some operations on GIVIFMs. A semiring is an algebraic structure (R,+,.) such that (R,+) is an abelian monoid (identity 0), (R,.) is a monoid (identity 1). distributes over + from either side, r0=0r=0 for all r∈R and 0≠1. A fuzzy matrix (FM) of order m×n is defined as where is the membership value of the ij-element in A. Let denote the set of all fuzzy matrices of order m×n. If m=n, in short, we write Fn, the set of all square matrices of order n.
An intuitionistic fuzzy matrix (IFM) of order m×n is defined as where aij, and are the membership value and non membership value of the ij-element in A satisfying the condition for all i,j.